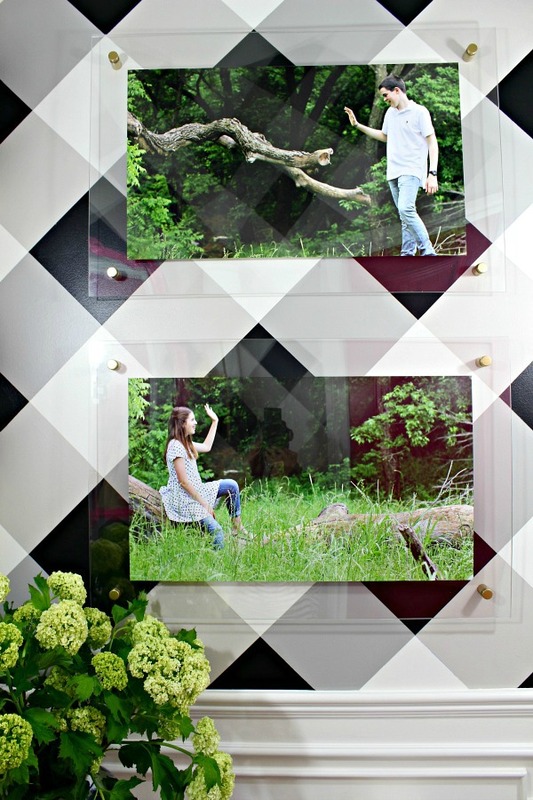 The pair of floating acrylic frames is one of my favorite parts of our new Powder Bath- that probably has nothing to do with the fact that the photos are of my growing way too fast kids. ;) All along, I knew I wanted to keep the artwork in there simple, and wanted something mainly green to go with the black and white color palette. I considered something like the palm prints that I talked about here, but in the end wanted something a little more personal. 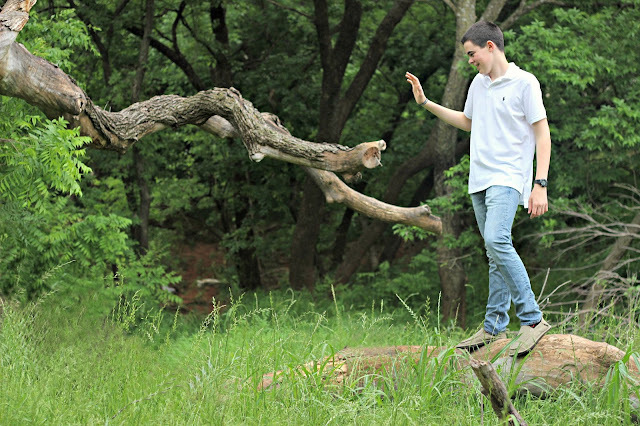 I envisioned some photos with the kids in the lush green creek area outside our backyard. 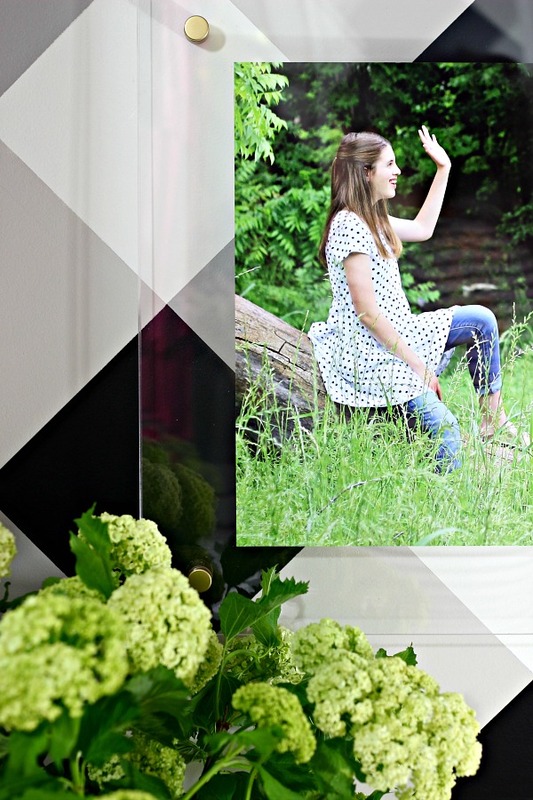 And, while I thought that formal portraits of my kids might be a little TOO personal when guests are visiting the potty, my sis brainstormed with me and we thought some whimsical photography art would be fun and a little more appropriate for the room. So, they humored me (it was Mother's Day, they had no choice), and wore the clothes I requested and posed how I asked and we snapped a few photos. 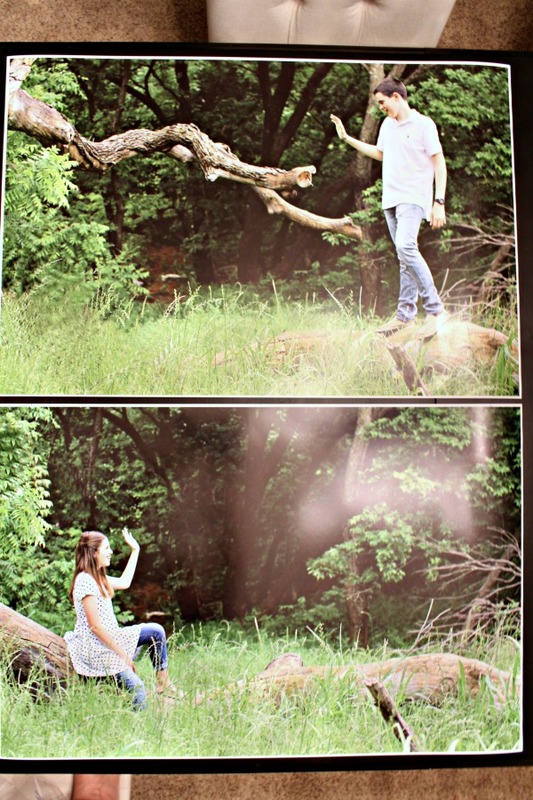 The idea was to make it appear like they are waving at each other while he's up in a higher spot than her. Although I would have done a few things differently once I saw the pictures, I didn't have time to re-shoot and what we had ended up working out fine, especially since I planned to trim the photos down once they were printed. You'll want to take the best quality photos possible (high resolution) since you'll be enlarging the photo. OK, so that's the background for this project. I think I get a little wordy sometimes, but I know some of you want ALL the details, and some just the Cliff's Notes version. ;) This is a long, detailed tutorial, but I wanted to include everything I learned along the way to help anyone out who might try this for themselves. 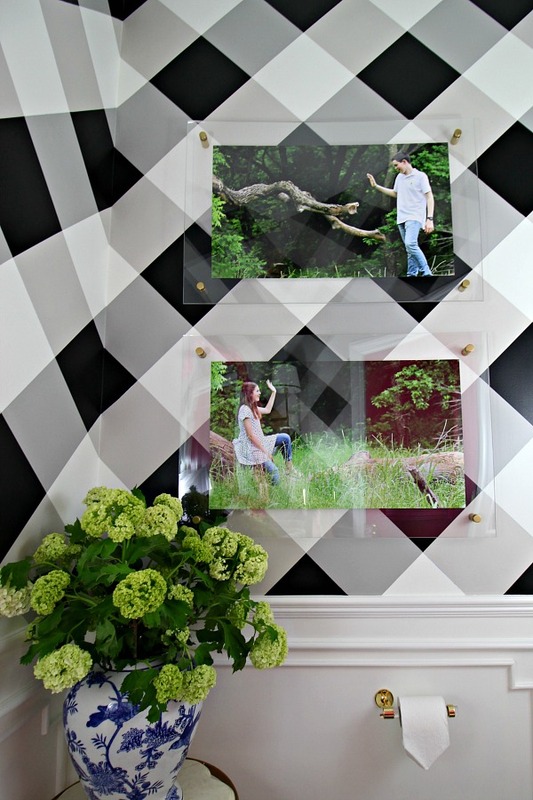 I wanted two symmetrical frames on the largest wall in the room, and once the check pattern on the wall evolved, I didn't want the frame to be too distracting. I've wanted to try these acrylic frames for quite a while since originally seeing Dina from Honey and Fitz post about them, and I thought this would be the perfect space for them. Be sure to check out her tutorial too, it's a little different than mine and you have to see the amazing scarves she framed! So, let's get to it... some of the materials may be subject to change depending on the size of artwork you're making. After I did a bit of editing on the photos I took of the kids, I saved it at a high resolution and had it printed at Sams. I chose the 20x30 poster size so my finished size would be a long rectangle like I wanted for the wall. I planned to trim the photos down, but printed them this size so I'd have plenty of room to work with. 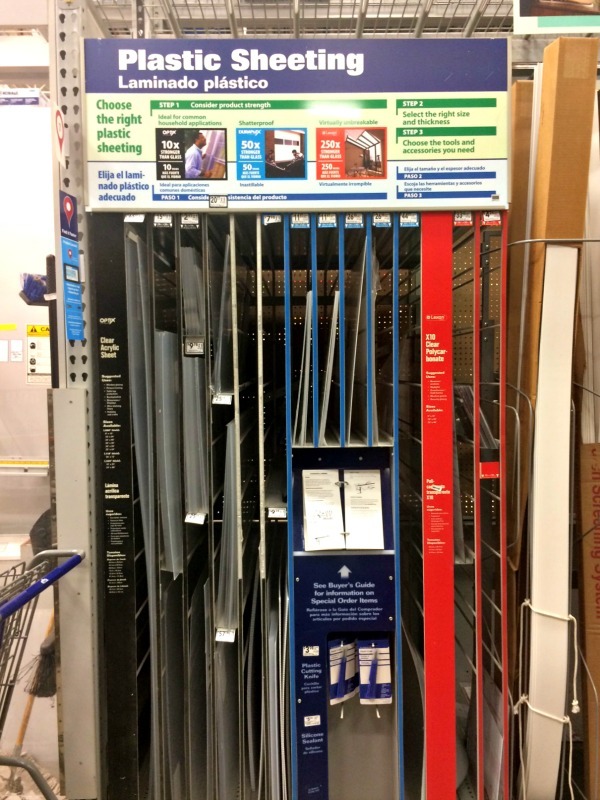 I purchased my acrylic sheets at Lowes. There is a pretty wide variety of sizes available right next to the "Glass Cutting Station". 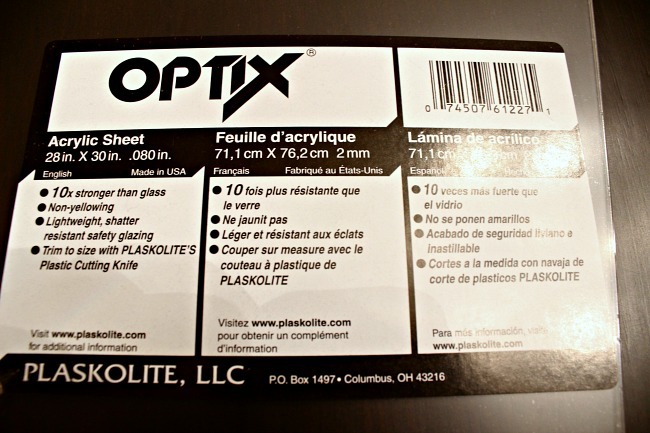 I used the Optix 0.08" thick clear acrylic sheets (there's a protective film on both sides, so they won't look clear until you remove that later). There is one option that's thicker acrylic, but it would have been more expensive to get the size and pieces I needed, and this thickness worked out great. Considering how to get the most bang for my buck with the acrylic that was available while making the most of the size I could use for the wall, I chose the 28x30" sheets and had each cut down to 20x30". They will do this for free at Lowe's. I purchased my standoffs from Amazon and although they were stainless steel and I wanted brass/gold, because of the amazing price I decided that spraying them gold was fine with me. If you want the real brass version they are available on Etsy. And just so you know, I tried every hardware store in town and they don't carry these, you'll probably have to order them online. 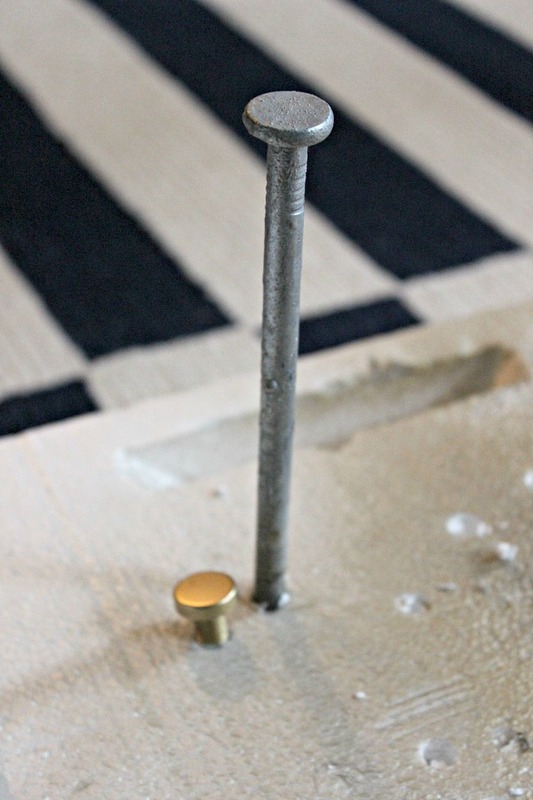 If you decide to paint, remove the clear washers that come with them and spray the base and the screw bolt top. Save for later on in the assembly process. I started this project in the wee hours of the morning the night before I had to be finished with the room, so please excuse the lighting and quality of some of the process photos. I started by laying out both photos and decided how I wanted them to line up once stacked on top of each other, and what parts I wanted to trim off. A sharp utility knife and good straight edge are important for this part of the job. I trimmed the photos to the size I wanted, which gave me a 2.75" border from what would be the edge of the acrylic sheet. I layed a piece of the acrylic over the photo just to make sure it looked how I wanted it to. 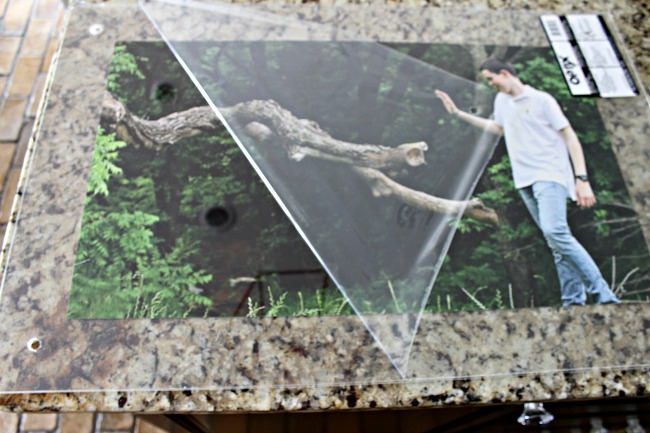 Your protective sheet should still be over the acrylic, don't remove that until the very end. Then, I marked where I wanted the standoffs to go. I just about split the distance between the edge of the photo and the edge of the frame and marked each corner. Mine were 1.75" in from each side at the corners. Now for the fun part! 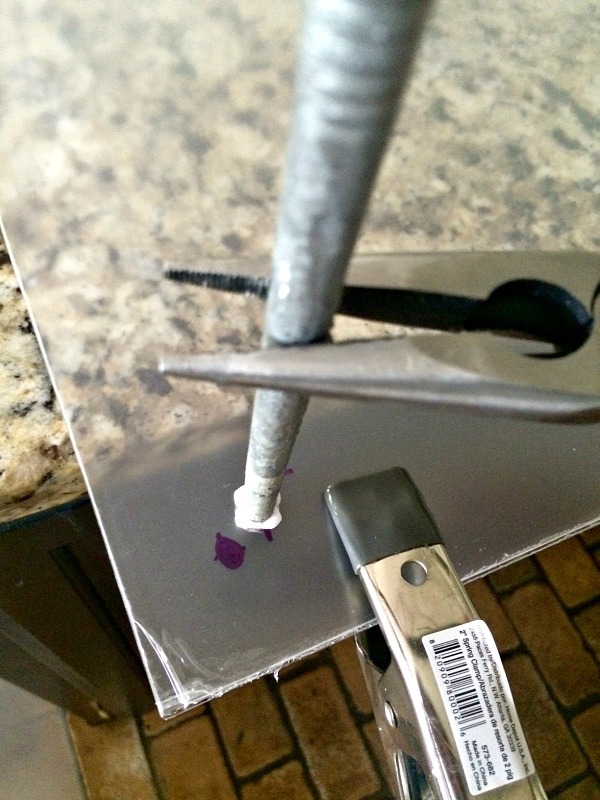 Rather than using a drill to make the holes (I was nervous about cracking the acrylic), I used a landscape spike. I bought a few different sizes at Lowe's, and when I got home I used a piece of styrofoam to "measure" to make sure the spike would make the right size hole. I stuck the spike in the styrofoam, and then put my standoff bolt (screw head piece only, not the base) in that hole to make sure it fit easily. You'll want it to fit easily, not to be tight at all. Then, I laid the pointed end of the spike (about 3 inches or so) across the flame on my stove (like Dina suggests) and let it get really hot. I probably let it sit in the flame for about 10 minutes, until it was SUPER hot... careful!! While it was heating, I lined up 2 pieces of the acrylic and clamped them together so the pieces wouldn't shift, keeping the corners where I marked the position for the standoffs visible. Your protective sheets are still on, and if one of the labels is in your way, don't worry about it, it won't matter. 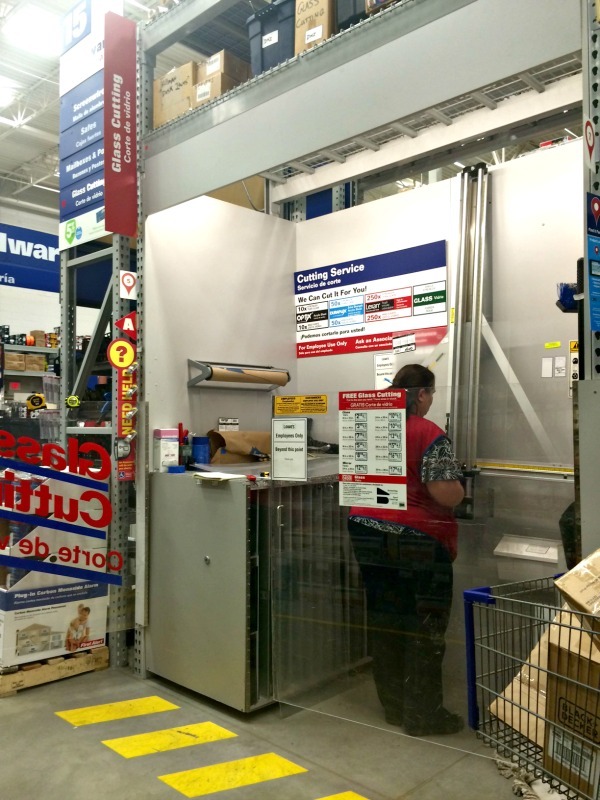 Let me add, when the Lowe's associate cut my acrylic sheets to size, I also kept the excess pieces she trimmed off. I used one of them to practice making my first holes in the acrylic just so I would know what to expect and not mess up my good pieces. Then, using a pair of pliers with rubber coated handles (again, use extreme caution in handling the hot spike), I picked up the spike and held it firmly with the pliers. Lining the tip of the of the spike up with the marks on the acrylic, I slowly pressed it through both sheets of acrylic as the nail melted it's way through. When it got through, I wiggled the nail around a little just to make sure the hole was big enough for the bolt. Remove the spike and it should still be hot enough to pierce another hole. I reheated the spike for a few minutes after every 2 holes. After all 4 holes are made, place the spike in a safe place and allow with to completely cool. Your pliers will be hot as well, so be careful with those too. The two sheets might be slightly stuck together from the melting process. If so, just carefully pull them apart. There will also be a plastic lip around each hole where the acrylic melted. 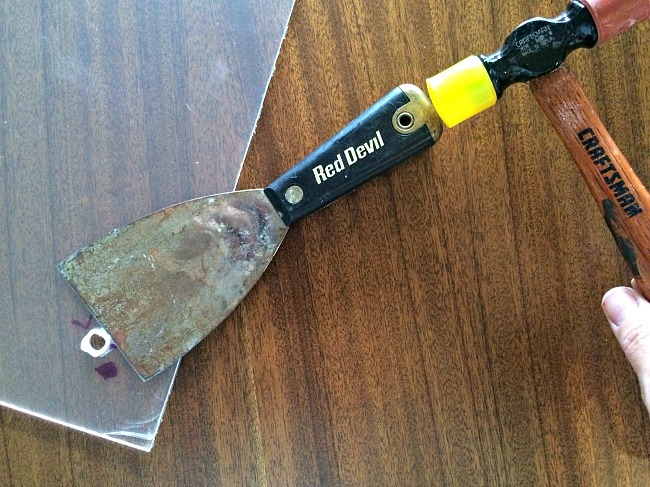 Once it cools it's easy to chip off with a few taps of a hammer and a putty knife. 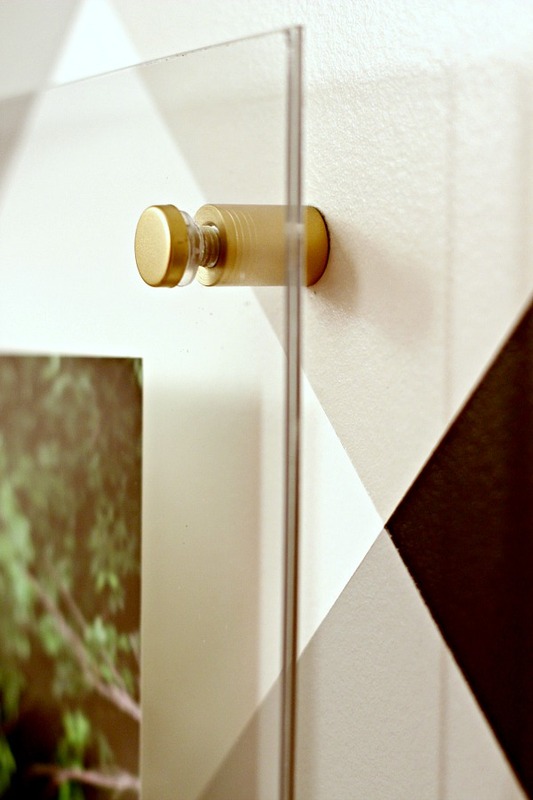 Make sure that your screw bolt from the standoff fits through the hole easily. If it's tight, place the hot spike through the hole again and rotate it around a little more to make the hole a little larger. 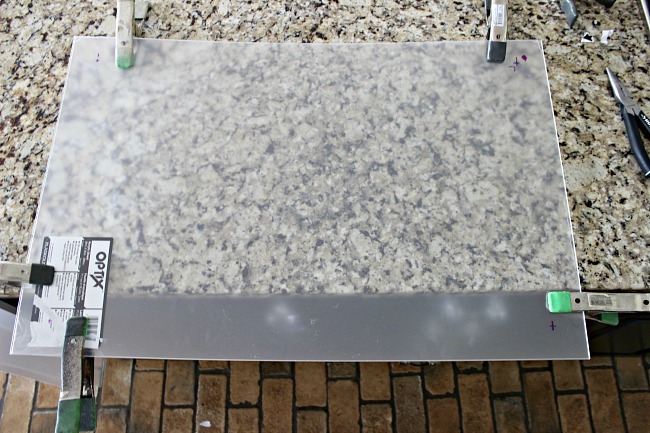 Now, the holes are in each piece of your acrylic and smoothed off, and it's time to remove the plastic film. 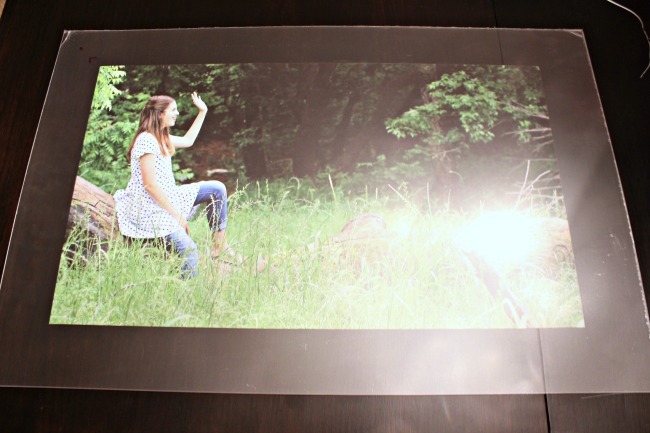 Peel back the film from just one side on both of your acrylic pieces. Use some type of adhesive (I used photo splits, but even double sided tape would be fine) to stick your photo to the back piece of acrylic (side with the film removed), centering it carefully. 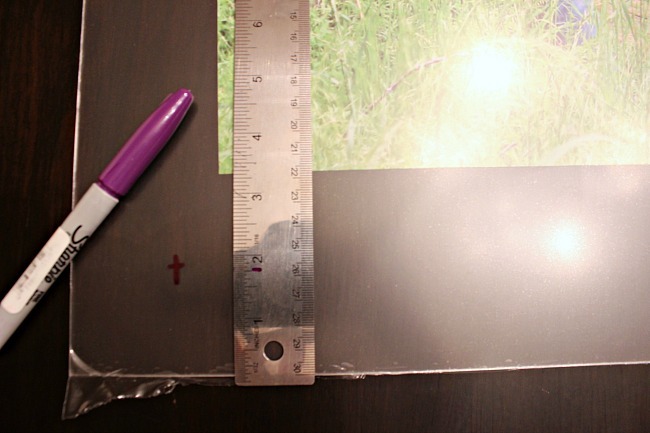 Then lay the top piece of acrylic over the top, film free side down over the photo. At this point, I took my frame and decided where I wanted it to hang on the wall. When it was in the correct position, I marked through the holes onto the wall so I would know where to install the standoff bases. Use a screw to attach each of the standoff bases to the wall (#10, 1.5" screws worked well for me). and install it on the wall by holding the frame up to the bases and turning the top part of the bolt through the hole into the base. Don't forget to use the clear washers that came with the standoffs, one behind the back acrylic sheet and one in the front. Hope and pray that all of your holes match up with the bases (only half kidding here... I did have to re-do one that didn't fit right)! That's it! It probably sounds more complicated than it is, it's just a project that you need to take your time with. It's not the cheapest option that I could have done for framing, but for this type of frame it wasn't too bad. I spent just under $100 total for all of the materials for the two large completed pictures and frames. OK, start thinking... what do you have that needs a cute frame? *Some affiliate links used. If you purchase products through the links I list, I might receive a small commission at no extra cost to you. These links help keep Dimples and Tangles running, thank you! Thank you for sharing this! 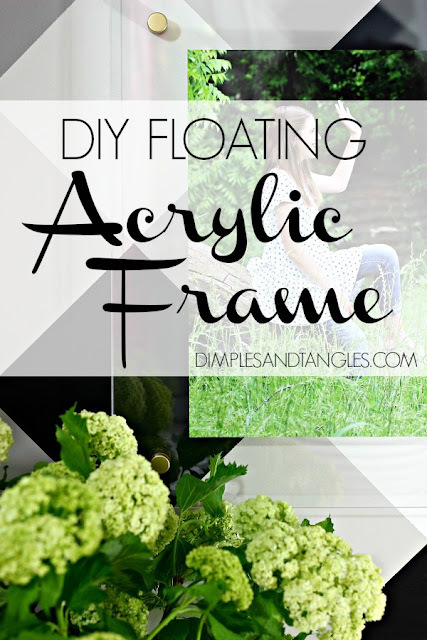 I love acrylic frames and have been wanting to try it out for some time. Maybe I'll finally get around to it this weekend. I've always loved the look of acrylic frames, but not the price tag. Thanks for this tutorial! They're still a little pricey compared to a standard frame, but yes, compared to ready made acrylic frames they're a bargain! I hope you give it a try! I love how your room turned out and the frames are amazing. Great tutorial. Thanks. This is awesome!!!! I love the ease and it looks so lux!!! Great project Jennifer. Pinning! Just trying to comment as I haven't been able to in the past. Such a cool idea! Your frames turned out awesome! I love how these came out Jennifer! I just took a few photos of a similar display at, of all places, a Chipotle restaurant (my kids were so embarrassed)...your tutorial is so clear and I love the gold hardware. Thank you for sharing. How do you hang the pictures? What type of apparatus is on the back that we can't see. Hi, it's explained in the post. :) The base has a hold that a screw fits through to secure it to the wall, then there's a bolt that fits into the base to hold the frame in place. 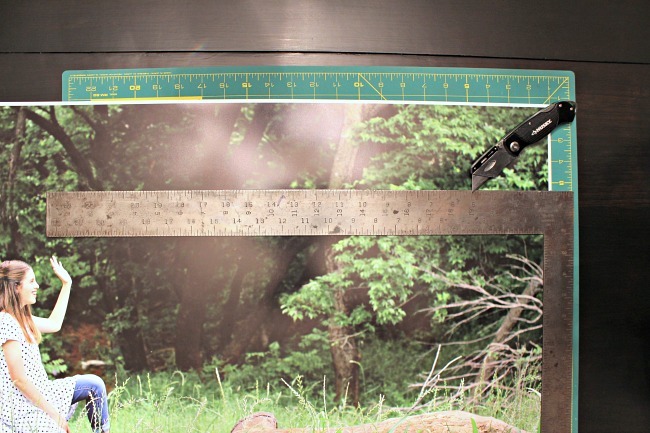 I just wanted to confirm you used two sheets of acrylic per frame, right? 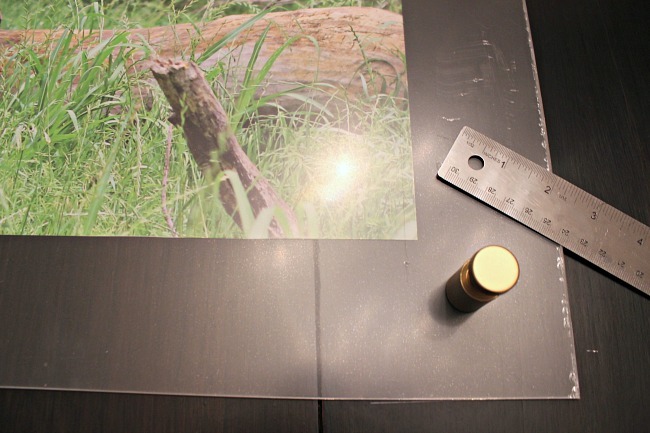 I found other DIYs that use only one sheet and just attach the photo or picture to the back of the sheet. Where did you find the brass standoffs? I can only find silver. Hi! These were silver, I sprayed them gold! :) If you want real brass, I've linked to some above in the post. If I use the thicker acrylic can I then use a drill for making holes. A drill would make me really nervous that it would crack, but I believe I've seen some other tutorials where a drill has been used.